With components searching your data can be fairly easy. 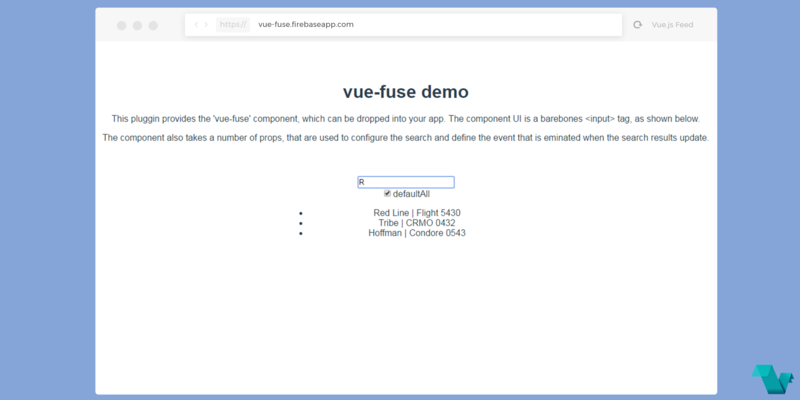 A lightweight Vue plugin, Vue Fuse is now available for fuzzy search using the existing library, Fuse.js. Take a look at the demo and proceed to see an implementation to a Vue.js project. Vue Fuse 1.2 update for the search plugin is out now, adds $search instance method for quick and awesome searching anywhere in your app! First, the keys property must be present in your data along with the list. keys is a list of properties that will be searched. list is the array of items that Fuse will search. Most of the props line up with Fuse.js options with the defaults set to match the default Fuse.js behavior. Here we are using the data from the example given in the plugin's repo. defaultAll, if true, then the results will include ALL items in the list when the search is null. If false, results will include no items when the search is null. The eventName is used here to give a name to the event emitted when the search results are updated. This is useful when you actually want to do something with the results.